Another entry in the Horror/Adventure genre of gaming, The Thing continues where the intensely scary and gory film of the same name by John Carpenter left off 20 years ago. Though interesting at times and even devilishly creepy at others, the videogame sequel of The Thing generally fell flat, failing to give us the horror gaming experience that fans of the genre crave so much. Check out The Laser’s in-depth review of this latest release from Black Label games to find out the full details of The Thing. 20 years ago fans of horror movies were astounded with the extremely creepy and very suspenseful remake of 1950’s silver screen classic, The Thing. Horror Filmmaker John Carpenter’s vision still holds up today after all of these years, giving fans skin crawling thrills with the films’ above average special effects, superb scriptwriting, and dynamic casting. To celebrate the 20th anniversary of the special brand of the ‘heebie jeebies’ that the movie The Thing has brought to the film going audiences worldwide, the horror fans at the gaming company Computer Artworks have joined forces with Carpenter himself to continue where the film left off, albeit on the small screen this time around. Available for the PC gaming platform, the video game The Thing at times is a hearty action/adventure horror based title that mixes the creepiest parts of the film with some of the best parts of computer gaming. Unfortunately, the game doesn’t always live up to the lofty expectations than one looks for when jumping into the world of the horror action/adventure gaming genre. For those few that happen to be unfamiliar with the background of the film version of The Thing, the storyline follows a group of American military scientists and soldiers based in the Antarctic who discover an extraterrestrial starship, buried for a millennia beneath the frozen tundra. Unfortunately for our human cadre, the pilot of the alien ship has survived its long, deep sleep, and awakens to wreak its’ special brand of havoc among the group. With the grotesque alien’s uncanny ability to infect, absorb, and clone organic matter, no one can truly be sure who’s a friend and who is the enemy, driving suspicions high among the survivors and adding even more intensity to an already horrific situation. The newly released PC game The Thing continues the story where the film left off. 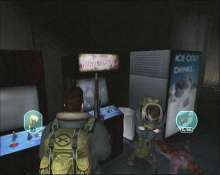 Players are given the chance take control firsthand of the U.S. Military Search and Rescue effort, sent to the freezing wastelands of the Antarctic to locate the missing members of the original science post. Soon after the team’s arrival, the gruesome truth surrounding the carnage and death at the science outpost becomes apparent as the alien infestation begins its attack on the rescue squad. Now, the players must guide the team through the deep freeze horrors that wait around the corner, and defeat the enigma that is The Thing. Survival Horror titles are a favorite of this reviewer, ever since the now classic Capcom game Resident Evil was released for the original Playstation oh so many years ago. For the majority of the game, The Thing captures the basic essence of what makes said Survival/Action Adventure titles so popular: a interesting script, action oriented gameplay, and an overall sense of creepiness and horror. The plot behind the game’s action and storyline is well developed and captivating, definitely paying homage to Carpenter’s film by keeping the player involved with the in game throughout as the story slowly unfolds. 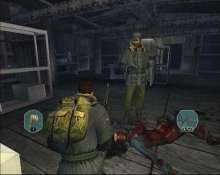 As with other games within the same genre, The Thing also contains the same basic 3rd person control structure that most game players will easily recognize, utilizing both a game pad and a standard keyboard in its design. The overall gameplay surrounding The Thing was easy enough to jump into, especially after running through the brief tutorial that actually starts the game off. 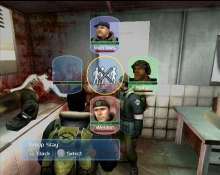 Players must navigate their on-screen persona’s through a myriad of adventures, including overall combat scenarios, minor puzzle solving, and straight out survival in the freezing tundra of the Antarctic, where waiting around too long can lead to permanent frost bite (and don’t forget about staying one step ahead of the enemies that comprise the being known as The Thing). Though three different levels of difficulty are available to play, there really wasn’t much of a difference when it came to the difficulty level of the puzzles found in the game: only the difficulty and number of enemy creatures thrown at you, plus the amounts of power-ups and ammo’s found were really affected. Visually, the game is outstanding, giving players a very detailed and crisp world to play in, as well as some very creepy looking members of The Thing’s family (the walker was one of our favorites, by the way). A word of caution: The Thing does come with a Mature rating due to the grizzly scenes that occur during the course of the game, as well as the course language found in the dialogue. Since the game is based on a Rated –R film, this shouldn’t be too much of a surprise. A couple of interesting elements are inherent within the gameplay of The Thing, making it stand out in an unusual way. For starters, the developers have included a system of squad play that most will find unfamiliar when it comes to Survivor Horror titles. Instead of the normal, one person adventuring, Computer Artworks has added other members of your unit that can help (or even hinder) as you continue through the game. Engineers can help you fix broken mechanical and electrical equipment, the medics can give that needed boost of health during the more difficult moments of the game, and the extra soldiers that pop up from time to time definitely make combat a little less hectic. Inventory items, weapons, and even ammo can be shared between different members of your team, allowing the player to tailor the overall effectiveness of an attack formation. The ‘team’ aspect of gameplay is also where the next bit of uniqueness lies within The Thing. Each character that the player encounters during the course of the game has a readable ‘Fear Factor’ that shows their specific mood during the course of the game. 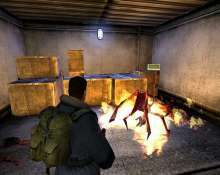 Characters maybe become agitated during hectic firefights and other terrifying situations that occur while playing The Thing, causing them to lose confidence in your ability to lead them to safety. If players do not keep tabs on their teams’ mental condition, the NPC’s are likely to turn on you in a moments notice, filling you with lead as if you’re an enemy. Overall paranoia can also affect how the team reacts to you and the current situation, just as it did during Carpenter’s film. Paranoia also rules in the game, since The Thing has the ability to infect and absorb hosts at the cellular level, forcing both the player and the NPC’s into a situation where they cannot be 100 percent sure who is an enemy and who isn’t. One moment your men are fighting the alien infestation together, the next, they’re screaming like a madman, sprouting a second set of appendages, and trying to eat you alive. Players can test their team members (as well as themselves) with scant amount of syringes found around the base camps; however, these devices are few and far between and can only be used once. 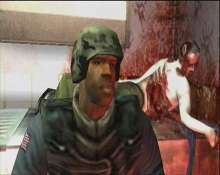 Although the gameplay and storyline in The Thing were both solid as a whole, the game still came off slightly weak for a Survival/Horror title. The game was definitely creepy, with the horrific and disturbing visual and audio effects (not to mention the John Carpenter-esque soundtrack), but it just never really hit the level of scary. It always seemed that just when things were getting really terrifying in the game, The Thing would switch paces and jump into the typical guns-a-blazing scenario that has ruined many a game in the past. A couple of other poor design features lowered the quality of the game, including some extremely difficult bosses (thankfully, the game only has a few) and problems with the sound found in the first few cut scenes. Players unfamiliar with this type of game also might find the lack of an ‘at-will’ save function frustrating, especially during the more difficult levels on the game. Still in the long run, the game does have enough positive attributes to negate most of the bad areas that cropped up during gameplay and should provide an enjoyable PC gaming atmosphere to most fans of the Survival Horror genre.